It has been a while since I’ve attended the Missionary Conference from start to finish. This time, attended it in Tagaytay along with other older FTWs as well. I won’t pretend to be a Young FTW anymore. 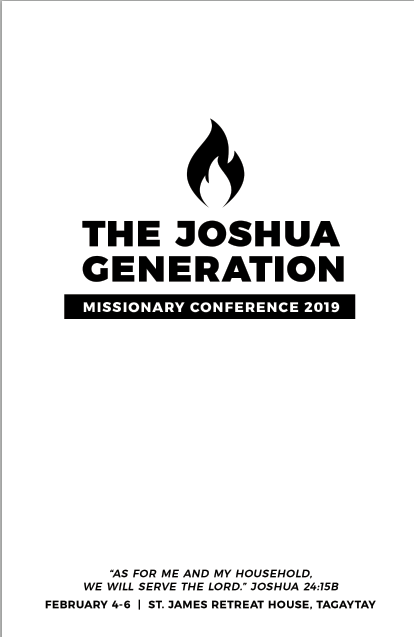 The topic was on being part of the Joshua Generation, and as always, conferences focused on uplifting and empowering missionaries are always, well, uplifting and empowering. It is good to have a time for those who give so much of themselves a chance to recharge and refill. It isn’t easy to be a missionary. They go out to areas and provinces all the time. Giving talks and recollections. Having meetings and planning sessions. Then they have to deal with deadlines and KRAs. And all still struggling with the “missionary salary” and also all the temptations of the world. It is not an easy task, but we are all struggling, striving and succeeding through it. Keep all missionaries in your prayers. They are answering the call of God by giving their lives to bring the Gospel to all people. They definitely need your prayer cover.